Timely and reliable insights to monitor the performance of the distribution channels. Having a reliable tool to control the system's performance, with real-time alerts that allow them to detect on time the possible issues and more in-depth analytics to monitor the overall performance. 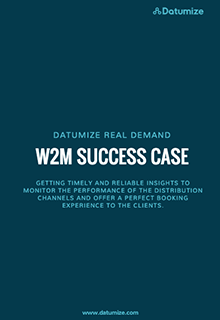 Datumize Real Demand solution, integrated with a BI and their booking engine software, to capture and manage all the data related to each interaction, request, search, response, and issue, in summary, everything that happens in their entire distribution system.